The time for stuffing something inside of an Oreo has come again. Only this time, it’s for Jenny from Picky Palate’s Baby Shower! I made Chocolate Dipped Peanut Butter Cup Stuffed Oreos. They taste superb because of the multiple layers of rich goodness. You’ll begin by slicing the Oreos in half. 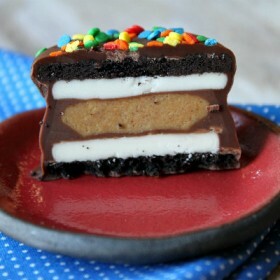 As you slice an Oreo in half, keep the sides with the cream for these Chocolate Dipped Peanut Butter Cup Stuffed Oreos. The other sides can be kept in a zip baggie in the freezer and saved for future Oreo pie crusts and other goodies! 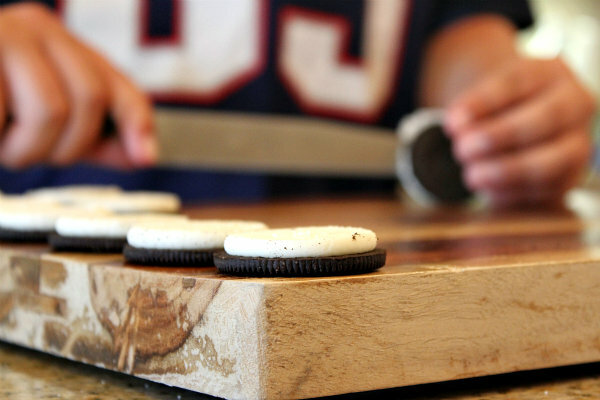 STEP 1: Put the Oreo half with the cream on a cutting board. 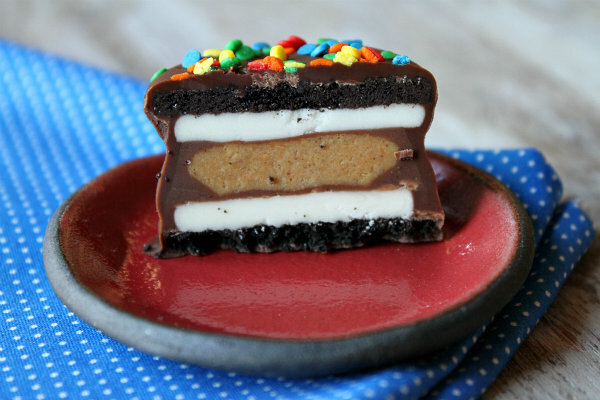 STEP 2: Place a Reese’s Peanut Butter Cup on top. STEP 3: Put another Oreo half with the cream on top and press down gently. STEP 5: Remove the UYC (Unidentified Yummy Creation) from the chocolate with a fork and set it on a baking sheet to let the chocolate harden. STEP 6: Scatter some sprinkles on top of the Chocolate- Dipped Peanut Butter Cup Stuffed Oreos. You can choose whatever color or colors you want. This picture is so cool. You can see all the different layers! 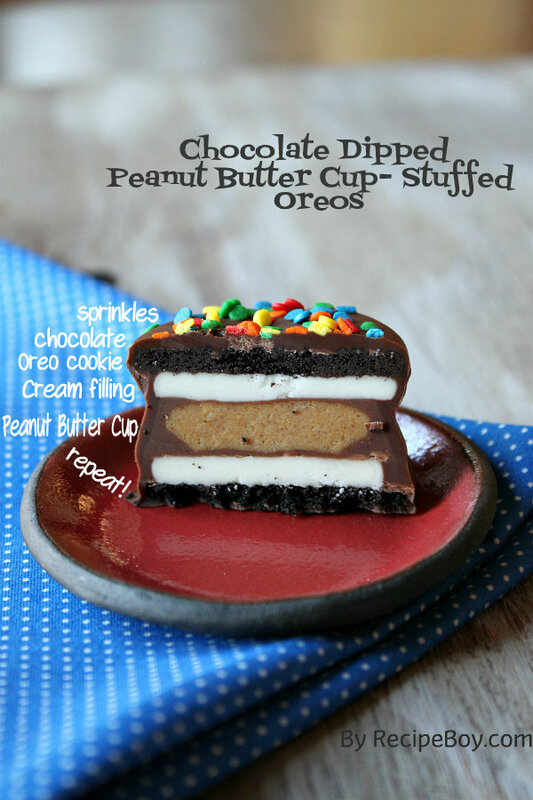 These Chocolate- Dipped Peanut Butter Cup Stuffed Oreos are mind blowing. My taste buds frequently crave that chocolatey peanut butter taste. My mom got the idea for this recipe from a candy shop called Candy Coated and shared it with me. Congratulations on your baby boy Jenny! I hope that he will follow in your footsteps and be a food blogger too when he gets a little older. I think that you should name him Peter. I like the name because it reminds me of Peter in The Brady Bunch (we watched The Brady Bunch in the car on our road trip this summer). Have you thought of any names yet? And even a kid can participate in his 2nd virtual baby shower… Like Me! Click below to watch a short video showing you how to make these Chocolate Dipped Peanut Butter Cup Stuffed Oreos, then print out the recipe and make them at home! Just like you'd find in a gourmet candy store! Slice each Oreo in half, careful to keep the cream filling on one half. Keep the cream sides and put the chocolate wafer sides into a zip bag. You can keep those in the freezer for making a future chocolate cookie pie crust. You will end up with 16 Oreo halves with cream filling. Set an Oreo half on your work surface (cream side up). Top it with a peanut butter cup. Then set another Oreo half on top (cream side down) of the peanut butter cup and gently press down. Repeat with the remaining ingredients until you have 8 cookie sandwiches. Melt the chocolate chips with the butter- either in the microwave or in a pan over low heat- until smooth. Use a fork to dip a sandwich treat into the melted chocolate and cover it completely with chocolate. Gently shake off the dripping chocolate, and then set it onto waxed paper or a baking mat. Sprinkle colorful sprinkles on top. Repeat with all of the treats. Refrigerate the treats until the chocolate is set. We kept our treats stored in a covered container in the refrigerator for cool munching on a summer day! I’m currently expecting a baby as well, so I can tell you from personal experience that these genius creations are a pregnant woman’s dream-come-true! Fantastic combination of decadent treats to create a true indulgence =). What a fantastic recipe! I would so love to try some. They look awesome! These looks totally decadent! You’ve combined two of my favorite treats into complete awesomeness. Brooks – you’ve got it going on with these! They look fantabulous! My hubby would be over the moon excited to eat these lol. Two of his favorite things combined into 1 treat! Great choice for Jenny’s baby shower too! We all know she loves Oreos, hee hee. Love the picture of it sliced in half with all of the layers showing! Brooks! I’m so impressed! What a tasty looking dessert, amazing photography and writing you’ve done. Awesome all around! Wow!!! Recipe Boy, thanks for making such a sweet treat for me today!! You and your mom are so great! Have a great day!! These look oh so good!!! Mmmm…. These are very impressive mister… and they look super tasty too! these are intense! they look amazing! That fact that you made these for Jenny – you are such a sweetheart! And boy, they look amazing! I wish I had a few of them of my own. Love the sprinkles on top, too! Ooo…Brooks! Those look AMAZING…and anything with Oreos is perfect for Jenny! Wow, that looks amazing!! I want 6!! this recipe is too good to be true! yum! What a perfect treat for Jenny- oreos + peanut butter, total winner for her. These look out of this world… Love the creativity. I could definitely eat a few of these… YUM! Oh man I thing you’ve come up with the ultimate treat RecipeBoy!! My family would LOVE to hep you finish these off……or need some recipe tasters!! These are such a great treat! Super job! I am speechless, and as my husband will tell you… that’s a serious accomplishment. My kids are going to flip their lids over these! Great recipe, Recipe Boy! These look so rich and delicious,so creative! This is unreal! So creative. Talk about sugar overload! Wow! They look absolutely gorgeous! Such an inspiration! Thanks! omGoodness! that sounds like heaven! i just bought ing to make the cookie dough stuffed oreoes. now i may just buy some reese cups too. 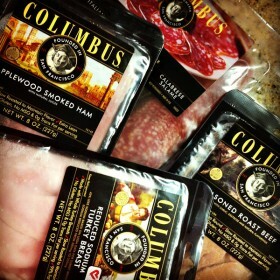 you rock, recipeBoy! Way to go putting two awesome things together! 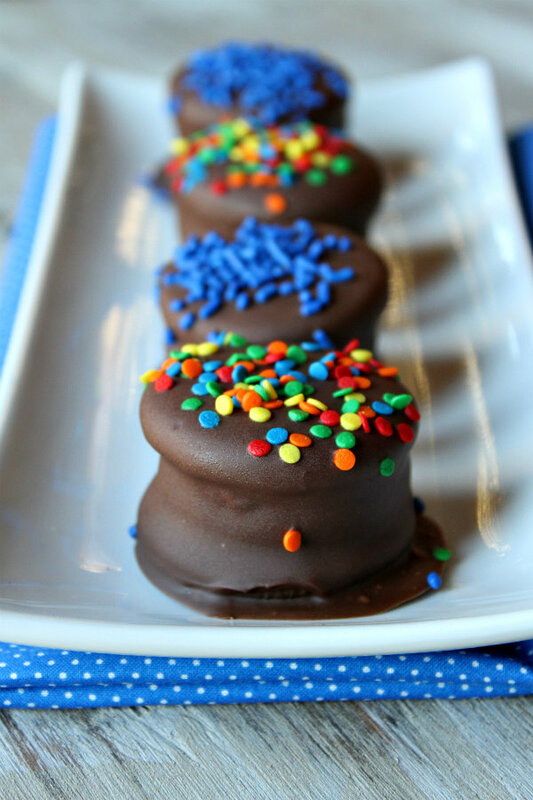 I’ve had chocolate covered Oreos before, but there are so much better! Whoah… These look really good! I’m not so much into sweet stuff, by these are great to look at and to eat, I’m sure. Great pictures, I love the colors. What an awesome treat!! I’ll have to make this as a surprise for my kiddos after school one day. Your Mom and I must be kindred spirits! These look AMAZING! I’ll think about the calories the day after I gorge on these! LOL! This is just the perfect recipe! My three favorite treats in one 🙂 Can not wait to make em then eat em! A bit messy to make, it’s easy to keep the oreo top on when the Reese is crush down then put on the top. Over all tastes awesome! Recipe was very yummy but I think the preparing the melted chocolate part of the directions was lacking explation and should be more detailed. Otherwise it was great! Having a sleep over tonight and making ’em! can’t wait…don’t think the kids are going to sleep at all!! You. In my mouth. Now. Yum !! I made it, loved it, and translated it into French to use on my blog (linking your website). I read about you today in my News Journal (Wilmington Delaware) Sunday paper’s USA WEEKEND section. I love your website and recipes. I am going to let my 10 year old granddaughter and 12 year old grandson know about it. They live in suburban Los Angeles and my granddaughter is just starting to learn to cook. I’ve Bookmarked your site so I can check it often. How did you cut them in half so perfectly? Love the idea–going to make this for my daughters baby shower. The 1 1/2 cups milk chocolate chips & 1 teaspoon butter did NOT work for us – the chocolate chips were not melting and once it did – it was burning. This was the best solution for us – use Almond bark, heat over low flame and mix with a wooden spoon 6-7 minutes – worked great; everyone loved the treats. These look amazing! 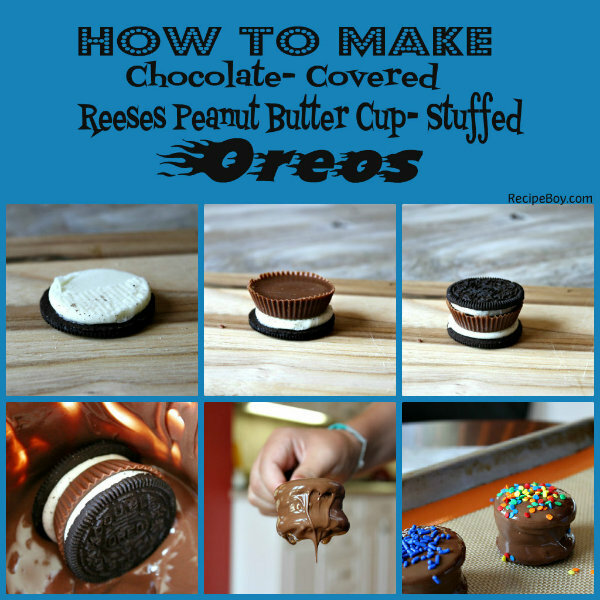 You should use the Reese’s peanut butter and chocolate filling oreos! Would they taste good with white chocolate as well? I tried these, but every cookie seemed to break in half. Or it would break while in the chocolate. What on earth should I do differently? You just have to be very gentle!